We've seen many exciting developments in transportation lately; electric cars, self-driving cars, ride sharing. But none of these addresses traffic congestion, which is, I think, a far more significant problem. Traffic signals have always run timed sequences, where the timings for each step are programmed by traffic engineering professionals. The more advanced setups have branches triggered by pedestrian requests or left turn lane sensors, but the steps are still timed. What if traffic signals were autonomous intelligent devices, each with an iPhone-like microprocessor, sensors, and connectivity? What if they were able to continuously adjust and optimize their timings for the most efficient possible traffic flow on their own? What if they could replace the monitoring and controlling functions of municipal traffic control centers? More efficient travel with less traffic congestion could likely save billions of gallons of gasoline and tens of millions of tons of exhaust emissions each year in the US alone. Less road construction would be needed as existing roads are used more efficiently. The possibilities are enormous. Immediate Efficiency Improvements:No more pointless waiting at a signal with zero cross traffic. "Nest for Traffic Signals": Any intersection could operate more efficiently by recognizing traffic patterns and dynamically adjusting the timing ratios and the timing cycle rate to optimize traffic as conditions change. Powerful intelligent traffic control would be available to all towns and cities at low cost. Metrics Instead of Timings: Traffic engineers would no longer set timings or offsets, but instead set the overall goals, metrics, and algorithms. Further, the metrics can be arbitrarily customized; "optimize for exhaust emissions here, but optimize for traffic throughput over here, and minimize traffic down there." Working Together: Nearby smart signals can coordinate with each other to optimize traffic flow with no central computer involved. Connections to nearby units share data, communicate needs, and dynamically adjust the timing offsets between the signals for optimium traffic flow. When there is a congested area, increase the green time to empty that area out while the signals feeding the area reduce their green time and encourage alternate routes. Adaptive Computational Resources: The computational task increases with the number of interconneted intellegnet traffic signals, but more processors are crunching on it. And enormous computational resources are available in the cloud. Modeling and Prediction: The traffic signals could also use the networked data to anticipate upcoming traffic situations. Potential congested areas could be emptied out before they become congested. Run Experiments: Operate with timings slightly tweaked, collecting statistical data to find optimal traffic patterns for each particular intersection. Share the experimental data with other areas, compile statistics, and become smarter over time. Boulevard Case: Timed boulevard lights currently require central control of all the units involved and an assumption of how quickly the cars can get through. Traffic gets messy if that assumption isn't met. Intelligent traffic signals could work together automatically providing synchronization anywhere without central control, dynamically adjusting the signal phases to accommodate a wide variation in conditions. Optimum synchronization could be maintained even with disruptions such as random pedestrian crossings. Further, intelligent traffic signals can bridge the gap between boulevard lights managed by the county/state and local lights managed by the town/city. Gridlock Conditions (cars stuck within intersections) could be flagged and efficiently emptied out with a separate algorithm. Sensors: The system would include an abstraction layer to accept traffic flow input from any kind of sensors that might be available (buried loops, video, whatever). It's a Platform: New parameters, algorithms, simulations, and software could be uploaded at any time. The system would have an open API for traffic management algorithms, a new market. So when some researchers develop an improved or specialized algorithm it can be uploaded and put to use with measurable results. Simulation and Lookahead:As an alternative to algorithms, intelligent traffic signals could perform continuous simulations fed by data from nearby units and, like a classic computer chess program, look several moves ahead and choose the best option. Verifiable: The system could demonstrate results at any time by reverting to the original signal timings and measuring the difference. Extras: Smart traffic signals could provide hooks to assist driverless cars. A phone app could provide a pedestrian walk signal at any intersection. Another phone app could charge the user for faster access through traffic and generate revenue for the city. Services: All sorts of monitoring, analysis, and support services could be available by subscription. A municipality could purchase smart traffic signals over time on a replacement basis, similar to the switch to LED traffic lights. Each new traffic signal will improve the performance of nearby smart traffic signals so there is an incentive to add more. The most appreciative customers would likely be suburbs with traffic congestion problems; they could get the advantages of synchronized lights, and more, without the expense of a central computer system. There are at least 300,000 signaled intersections in the US. International sales would be substantial. 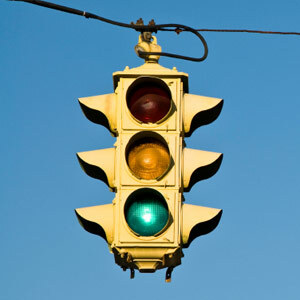 Cities and counties are accustomed to spending $50,000 to $500,000 to purchase and install a traffic signal. Annual revenues would be billions of dollars in direct sales alone. This could be an enormous business that has a profoundly positive effect on the environment. There could be several implementations. One could be a drop-in replacement for current traffic controller electronics, typically located in those weatherproof boxes you see at intersections, and that would interfaces to the existing sensors and lights. Another possiblity would be an all-in-one traffic light assembly with a self-contained controller and a Lidar unit mounted on the bottom. This would have a low installation cost, and the Lidar unit would be able to monitor traffic very accurately without being an invasion of privacy. I'm not seeing evidence of anybody currently doing anything like this. There is a new development in traffic signals called "Adaptive Traffic Control" (DOT: Adaptive Signal Control Technology), but all implementations so far seem to be major projects involving a central computer system. There are some experiments in the references below, certainly, but I don't see any patents, or solid progress, or any in use, or anybody approaching it the way I've described here. In 2013 the city of Los Angeles finished a $400 million project to sequence all of their 4500 traffic signals from a central computer facility staffed with traffic engineers. (NY Times: To Fight Gridlock, Los Angeles Synchronizes Every Red Light) It doesn't appear to have helped; Los Angeles has the worst traffic in the world according to a 2017 Inrix study. This is doable right now; no new technology is necessary, and the algorithms can be developed over time. The market, world wide, might to be somewhere around $100 billion.